From emerald green to sapphire blue, the Omogo- and Niyodo-gawa rivers display glistening variation. 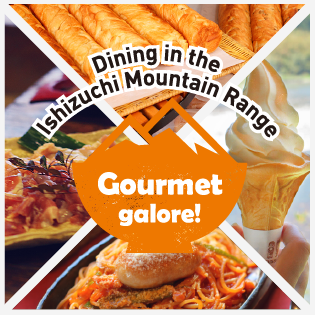 Over the course of many long years, the flow of their clear waters borne from the Ishizuchi Mountain Range has hewn rock and nourished the greenery to form beautiful ravines and rivers. Blessed with beautiful scenery and a rich abundance of water, the Omogo- and Niyodo-gawa basins provide an ideal setting for getting acquainted with the rivers and enjoying river sports. 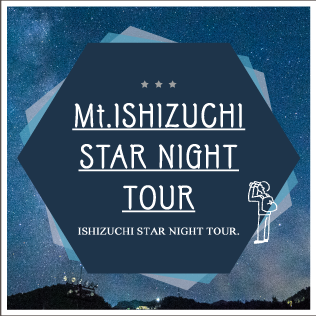 The Ishizuchi Mountain Range, home to many headwaters, contains a variety of beautiful rivers large and small. The Niyodo-gawa River, with its Mount Ishizuchi-based headwaters, is a river of such clarity that it has even been selected as having the highest-ranking level of water quality in Japan and is visited by many sightseers who come with the thought of catching a glimpse of the “Niyodo Blue.” It also provides opportunities to enjoy canoeing, rafting and so on. 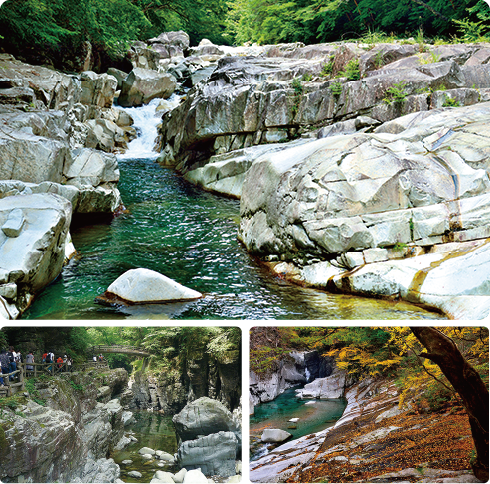 Nearer the headwaters of the Niyodo-gawa, the river is known as the Omogo-gawa, and the Omogo-kei gorge located in these upper reaches forms the largest gorge in Shikoku. With water flowing over large slabs of rock plus deep pools and successions of little waterfalls, it’s an optimal site for canyoning. 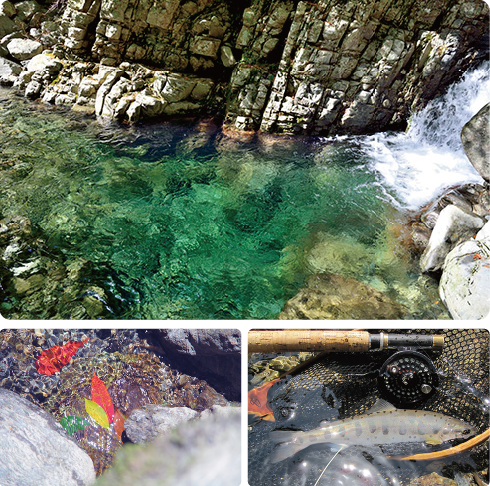 Stream fishing spots abound, and it’s a popular fly fishing destination too. The Omogo-gawa River, with its source found on the Ehime Prefecture side of Mount Ishizuchi, merges with the Kuma-gawa River to form what is called the Niyodo-gawa as it enters Kōchi Prefecture. This beautiful river, even called a “river of miraculous clarity,” has received exposure in various media and has served as a location in films and television dramas as well. 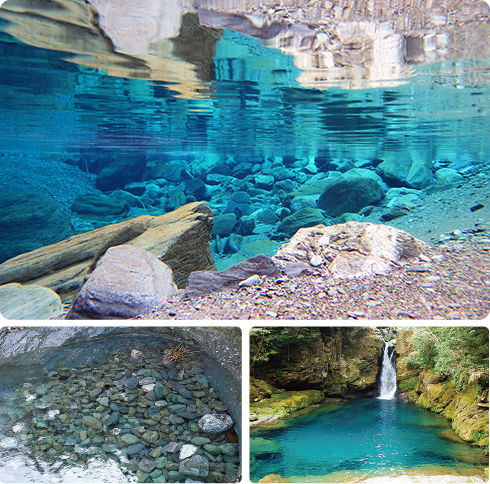 Given the name “Niyodo Blue,” the waters of the Niyodo-gawa glisten jewel-like in a mysterious teal color. 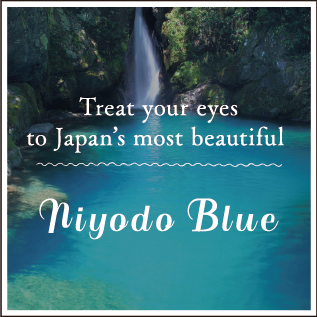 Prime spots for experiencing “Niyodo Blue” are at “Nikobuchi” and the fantastical “Hodono-no-taki” waterfalls. 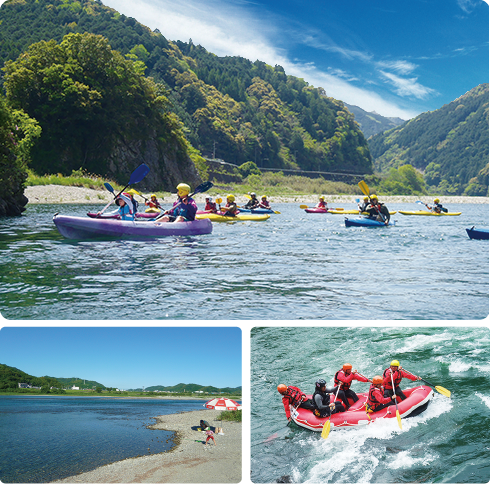 A river of rare, exceptional beauty, the Niyodo-gawa is also a hub for river sports and recreation. 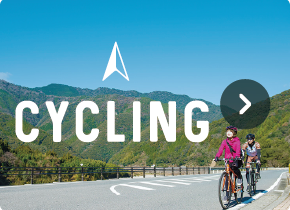 Among locations offering river recreation for the entire family are Ino-chō’s Hagawa River, Hatten-ōhashi Bridge and the Kada campsite. Plans are available that offer canoeing (and kayaking) experiences, rafting and river-cruising. Anyone from beginners to advanced recreationists can enjoy canoeing, offering an unhurried, graceful enjoyment of nature along the descent of the river. Some plans feature canoeing and snorkeling as a set and guided rafting so that even those uncomfortable swimming can participate with peace of mind. Other plans include spa bathing following recreation on the river, with lunch included, allowing visitors to come virtually empty-handed as long as they have a bathing suit and towel. Located near the foot of Mount Ishizuchi, the Omogo-kei Gorge on the upper reaches of the Omogo-gawa River is the original source of the “Niyodo Blue.” Almost like works of art produced by nature over the course of many years, the gorge features water of stunning clarity, smooth rocks polished by the flow of the water, massive boulders and peculiarly shaped rocks. Walkways through the gorge are maintained so that visitors can enjoy soaking up negative ions with their whole bodies. 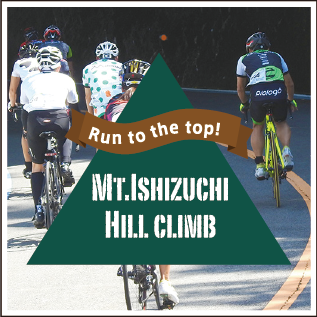 The Omogo-kei Gorge is also an access point to Mount Ishizuchi for advanced climbers, and the clear blue waters of Kumabuchi and the Tora-ga-taki Waterfall along the route are not to be missed. 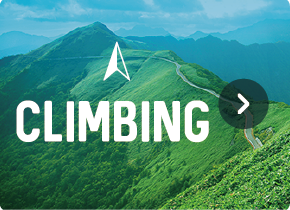 The path is not maintained further beyond, however, so if you proceed, make sure to be properly prepared for mountain-climbing. 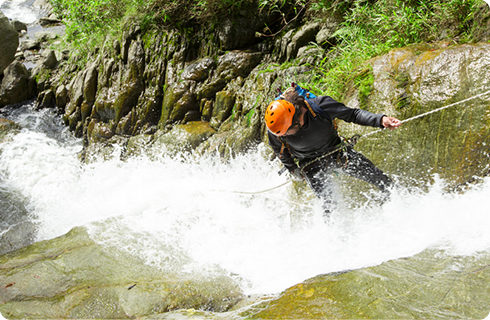 You can also enjoy canyoning, where you wear a wetsuit and helmet, slide across slick-topped boulders, feel the crash of waterfalls and plunge into pools. For details about rafting, canoeing and canyoning, please check the external sites listed below for information on the recreation courses available, safety warnings, reservations, etc.